Back on December 30th, 2007 I had the pleasure of hanging with Snowshoe’s Ed Galford for a few hours. Laura Parquette of Snowshoe hung with us, as did my sister, Colleen Comer, who was intrigued to learn a bit more about the process of making snow. I had intended on posting the story upon my return home, but timing is everything in this industry (both the ski industry AND writing about it) and Old Man Winter began dumping snow after snow on the West Virginia ski areas and that sort of diminished the interest in this story. Don’t get me wrong, without ongoing snowmaking at our Southeast and Mid Atlantic resorts, Mother Nature could not offer us more than a handful or two of snow days. However, now that we are entering March and the last four to six weeks of ski season, snowmaking and snow maintenance take on a whole new measure of importance doesn’t it? I thought that many of you would enjoy hearing something a bit more in depth that just the traditional "these guys are important to us" comments, so to that end I created a decent video compilation of my visit with Ed Galford, Snowshoe’s Vice President of Mountain Operations, that will hopefully add some "color" to this story. The first stop on our visit was at Snowshoe’s Shaver compressor House. The building that we were in held six Ingersoll Rand Compressors capable of cranking up 5500 cfm each, however in all Snowshoe boasts 15 high-powered compressors and 10 pumps that draw water from the resort’s lakes. Together with the air and water, they can make 2,500 TONS of snow per HOUR when conditions are right. A lot of them are fixed and many are portable. However, it has taken automation technology to turn this weather-dependent business into a more stable enterprise. At the heart of Snowshoe’s state-of-the-art snowmaking system, which maintains 60 slopes is a GE Fanuc Automation (Charlottesville, VA) solution implemented by system integrator Advent Electric (York, PA). With the help of Advent and GE Fanuc, Snowshoe is successfully managing its most recent expansion. "We’re working with four remote areas, yet we’re able to control everything from a single station," notes Jeff Tumblin, Snowshoe’s compressor house supervisor. "In the past we’d have to travel eight miles or more—30 minutes each way—to troubleshoot something as basic as a loose wire or a power outage. Now, it’s all at our fingertips. It’s a lot easier, and we have better control." The new automated system allows operations personnel to monitor the snowmaking system from their offices, and make decisions about placement of snow guns and when to bring additional snow guns on line. Snowshoe’s Ed Galford, Vice President of Mountain Operations, provided me with a first hand look at Snowshoe’s snowmaking operations and trust me there is a WHOLE lot more that goes into making snow that just cold temps, air and water! One example of this is the fact that the air that comes out of the compressors used in the snowmaking process is well above water’s 220ºF boiling point! Galford shared, "The air that comes out of the compressor is about 260ºF, so we cool that down to about 34° or 35°, whatever we can get it down to without freezing the radiators up." That’s right RADIATORS. The radiators Galford referred to are similar to those used to keep your car’s engine cool, but Snowshoe uses an array of massive radiators that are located outside the compressor building, taking advantage of the cool outside air. The air and the water pumped from Shavers, Silver Creek and Western Territory Lakes are distributed to the slopes by a network of nearly 50 miles of underground supply lines, according to Galford and Tumblin. Hydrants and snowmaking equipment are positioned at about 100′ intervals along all 60 trails and when the weather cooperates air is pumped at a pressure of 70 to 90 pounds per square inch and water at 560 psi to the snow guns. A lot of the newer equipment around the mountain offer snowmaking equipment that have their own compressors that don’t rely on the compressor house and some of those guns can crank out 250 gallons of water per minute, which rapidly crystallizes into snow flakes. Together, the resort’s snowmaking plant can pump about 8,000 gallons of water per minute," Tumblin said. According to Ed Galford that equates to the previously mentioned 2,500 tons of snow per hour. I remember a while back when Ed Galford, Joe Stevens and I were speaking and Ed shared that Snowshoe’s system could cover FIVE football fields with a FOOT of snow in one hour! If you ever want to get into a conversation with someone who knows everything there is to know about snowmaking, to the degree that he can make your eyes glaze over – Ed Galford is your man. When you question Ed about nearly any aspect of the industry as it applies to snowmaking and managing snow at a mountain, not only can he share information in laymans terms…he can also spout knowledge that is as technical as it gets! As an example, during my visit with him back on December 30th, I asked the question that all of us wants to know. I asked, "Ed what kind of power bill do you guys have to pay a month?" He answered first in kilowatt hours burned, etc…and then when he realized that I was totally lost, he settled on an answer that he knew most of us would understand…AFTER we all finished choking on the answer – "about $200,000 a month." He said it very matter-of-factly. Then he added, "We run just about 10 meg, 10 megawatts just out of this facility. In total, with our snowmaking and commercial use here at Snowshoe, probably close to 40 megawatts." I nodded as though I had a CLUE what that translated to…but I do know it was a lot! The bottom line is that Ed Galford knows everything there is to know about EVERY piece of equipment in the various stations that make up Snowshoe’s snowmaking plant. He can spout of which is oil free, how many amps or watts each IS or uses. He knows the difference between a two stage or three stage plant…or how many horsepower this or that motor (that drives the plant) is. For any snowmaking system to work, you have to have water and that part of my visit with Ed Galford took us down to Shavers Lake. The lake makes up the scenic part of your view if you stand at the top of the Powder Monkey lift and look down. It is the lake that is located at the bottom of the Ballhooter Lift and that the Boat House is built beside. Ed stated, "In 1996 we realized that we were going to need to build a larger lake. Until then the lake covered only about seven surface acres probably carrying a couple million gallons of water. Now we have 40 surface acres holding 101 million gallons." Be sure to check out the accompanying video to this story because here is another spot where Ed can really turn on the technical aspect of what was required of them to build the larger lake. Galford is first and foremost an environmentalist and his initial expertise and background was as a forester. He related that when they began to build the larger lake, that one of the main obstacles was that of some of the wildlife that was indigenous to the area. He related, "The largest hurdle we had was the Cheat Mountain Salamander and West Virginia Northern Flying Squirrels which are two endangered species that we had to overcome in this project." The planning and handling of numerous issues took the better part of two years and the same year that they began building the larger lake was the same year that they added the Western Territory trail – Shays Revenge. Galford shared issues and dates where they were making snow for the resort even before everything was completed! I know that a lot of you are probably thinking the same thing that I was during my interview with Ed. WATER. With much of the Southeast suffering from medium to severe drought, I asked where they stood as far as water was concerned. Galford shared water elevations and numerous other facts – all of which translated to the fact that during my visit with him…they were TWO FEET HIGH. AND THEN WE WENT INTO THE PUMPHOUSE! <The sound coming from these bad boys is deafening! Literally! Before entering Ed provided me with some industrial strength earplugs and told me that there would be no conversation within the building. Being the novice guy that I am regarding snowmaking ops, I thought that maybe he was alluding to some sort of secret society wherein no secrets would would be shared. Okay, I KNEW that the earplugs were for my protection but I figured we’d be able to shout above the noise to hear what it was I was visiting. All I can say is "OH MY LORD was that place loud. The accompanying video that includes our bit of time inside the pump house does it no justice whatsoever! There is no way that you can even think clearly after a few minutes in that building and I now know why Ed Galford wears a hearing aid. Enough about the pumphouse. Suffice to say that it pumps all the needed water to the system! A lot of our readers have written us from time to time about "the waste" of water at ski areas and many have questioned that with a shortage of water, how could resorts continue to pump away. The truth is that Snowshoe’s setup is much like most ski areas in that whatever is pumped onto the mountain ENDS UP back down to the very water supply it was pumped from. It may be of interest that Ed Galford, is Vice-President of the Elk Headwaters Watershed Association is one the founding members of the watershed association. He is also a graduate of the Forestry School at West Virginia University. 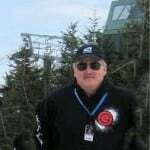 Ed started working with Snowshoe in 1974 as a snowmaker, and is now employed as Vice-President of Operations at Snowshoe Mountain Resort. His duties on the mountain are too numerous to mention but they include planning for the future and working with all of the state and federal departments to implement any such growth that the resort looks to make. He’s also a TRAIL DESIGNER! A lot of our readers wrote us after trying out the three new trails at Snowshoe back in December. "Sawmill" which is located skier’s right of the Widowmaker slope and Soaring Eagle Express lift, and the middle of the three new trails, opened for the first time on Friday, December 21. A 10am ceremony included a ribbon cutting with Snowshoe Mountain President and COO Bill Rock, Sawmill Village Project Architect and Developer Tom Tretheway and Ed Galford, VP of Mountain Operations for Snowshoe Mountain, who served as the trails’ designer. The trail is marked for expert skiers, and is a long, challenging run, similar to Widowmaker, a long-time favorite of Snowshoe regulars. Sawmill measures 2790′ and has a vertical drop of 630′. The trail will be serviced by the Soaring Eagle lift, a high-speed quad the mountain added last season. The Sawmill Trail, as well as the other two new trails added prior to the season is a cooperative project with the new Sawmill Village. The Ed Galford that I have come to know over the last several years is a "guys guy" and simply would not want me to make this story about him. His team that includes dozens of hard working snowmakers who toil at all hours of the night to place and monitor snowmaking progress is an integral part of the process. Galford IS Snowshoe or a very large part of it, having spent 33 years working there. However he’s not the only one with roots deeply planted within the Snowshoe snowmaking system. Jeff Tumblin, who serves as Snowshoe’s compressor house supervisor, Energy Center Manager and Grooming Manager (he’s the guy who leads the guys responsible for laying down all of that corduroy! ), has been at Snowshoe forever (sorry Jeff I don’t have the numbers). There’s an old photograph during the founding years of the mountain that includes Doc Brigham (the resort’s founder) and in it are Jeff and Ed! MUSIC TO MY EARS…what little I can hear! So the next time you are blessed to ski and ride some awesome conditions at Snowshoe Mountain just know that there is a lot of time, manpower, experience and money going into those sweet conditions beneath your skis. The humming at Snowshoe Mountain resort rarely stops as long as temperatures at 4,848 feet are below freezing. The sound is music to Ed Galford, who often collaborates with other Intrawest-owned resorts from Vermont to British Columbia on how and when to make snow. "We don’t want to have any missed moments of snowmaking weather," said Galford, who is in his 34th ski season at Snowshoe. "That goes for everybody in the ski industry, especially in the Southeast. That’s the challenge, getting the cold weather at the right time." Without snowmaking equipment, and the men who know how to use it…the industry would be crippled. One such guy is Ed Galford of Snowshoe Mountain. In addition to his countless hours at Snowshoe, Ed counts fishing, hunting, and motorcycling as some of the pastimes that he enjoys as well as working toward responsible stewardship of the communities and environment within the watershed. Ed, born in Pocahontas county, resides in the headwaters of Big Spring Fork with wife Winnie, and two daughters, Casey and Greer. The conservation and sustainability of the watershed resources are the primary focus to insure a healthy natural resource for the future generations that will appreciate the Elk Headwaters. Ed is also involved with the Shavers Fork Coalition, a watershed group based out of Elkins, WV. <Ed Galford or Harrison Ford? Editor’s Note: If you’re ever up around Pocahontas County and think you’ve just spotted Harrison Ford on an adventure trip…make certain that it’s Harrison, because it very well MIGHT be Ed Galford! By the way, the photo to the left IS Harrison Ford. Next articleHow Long Will Resorts Stay Open; We’re Speculating Some Today!